If you’re quite familiar with the 1966 original Broadway cast album of Cabaret, two lyrics are going to jump out at you when you listen to the 1968 original London cast album. Take it from someone who read the script of Cabaret in spring of 1966, months before its first rehearsal, when show was called Welcome to Berlin: the lyric that Kedrova sang was actually the first version that Fred Ebb wrote. He assumed that the actress who’d be cast as Fraulein Schneider would be a heavy-set one. The chance to have the thinner Lenya in a Berlin-centric story, however, was too delicious to pass up. Better to write a new lyric than to lose Lenya. When the more Rubenesque Kedrova was cast, Ebb reverted to his original lyric. Says my buddy Aubrey Berg, who’s spent a good deal of time in London, “No, the British simply don’t use the word ‘gas’ in this context.” And that got me thinking about the changes made in lyrics in Broadway musicals that received London productions, all because of different regionalisms. Guess that children in England are denied the pleasure of going door-to-door every October 31 and getting free candy. Yeah, they don’t know baseball in the United Kingdom. That’s why in 1958, English movie exhibitors changed the title of Damn Yankees to Whatever Lola Wants before the film debuted there. They apparently feared that British audiences would assume that a picture called Damn Yankees would concern the American Revolution. And speaking of that skirmish, when 1776 was announced for London, I fully expected that Sherman Edwards would change one lyric: the one in which Adams, Jefferson and Franklin roar “We say to hell with Great Britain!” Wouldn’t that be too much for Londoners to take? But Edwards retained it and every other lyric in “The Egg” — which may be why 1776 laid an egg in the West End. doesn’t mean that Londoners would know it. And while Hackensack isn’t any more or less famous, it’s at least a funnier word. Remember Neil Simon’s rule: “Words with a ‘k’ are funny.” Hackensack has two. Bye Bye Birdie changed a city in one lyric too. Spanish Rose on the Broadway cast album sings that she hails from “Allentown, P.A.,” but on the London disc, she calls “Pittsburgh, P.A.” her home. Londoners probably didn’t learn of Allentown for at least two more decades, until Billy Joel started singing about it. Earlier on the London disc in “An English Teacher,” Rose doesn’t dream of marrying Albert and becoming “Mrs. Phi Beta Kappa” but “Mrs. College Professor.” Phi Beta Kappa, you see, is an organization that is (to cite another Strouse-Adams show) All-American. If Londoners don’t know American cities, they can’t be expected to know American schools, either. So on the Broadway cast album of Do Re Mi, after Tilda Mullen decides to send her brother Benjy to college, Hubie Cram orders “One Yale.” The university in question becomes “One Oxford and Cambridge” on the London edition. Leigh, a lyricist with a decidedly American sensibility, had much reworking to do before the show opened at the Cambridge Theatre on Nov. 18, 1964. We find differences right from the opening number, “The Truth,” in which movie personality Belle Poitrine describes the memoir she plans to write. Many proper names are eliminated: Doubelday’s, then a prominent American bookstore; Mary Astor, the Oscar-winner who wrote the great-grandma of best-selling tell-alls; Casey Stengel, arguably the New York Yankees’ most famous manager; Harriet Beecher Stowe, whose Uncle Tom’s Cabin probably didn’t sell many copies in Victorian England; and Brendan Behan. Not that the famous Irish writer-lush wasn’t famous in Britain; he was probably more well-known there than he was in America. After all, in the London Flower Drum Song, he’s even mentioned by the “Irish Colleen” in “Gliding through My Memoree” in place of “Erin Go Bragh.” But Behan had died from alcoholism fewer than nine months before the London premiere, and at a terribly young 41; Leigh probably dropped the lyric out of respect. Does England not have Boy Scouts? 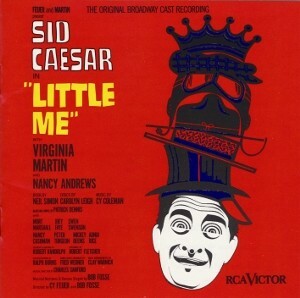 On Little Me’s Broadway cast album, George Musgrove tells Belle Poitrine, “You ain’t no Eagle Scout” — but in London, he proclaims “You ain’t no sweet Girl Guide.” And in “Be a Performer,” the London Little Me teaches us that the expression “up the river” – meaning incarceration – hasn’t made it to England. “Up to Holloway” is used instead, referencing the prison located on Parkhurst Road in London. And for good reason: while “fanny” in America is a slang word for one’s gluteus maximus, in London, it means the female genitalia. ‘Nuff said. Peter Filichia also writes a column each Friday at www.kritzerland.com.and www.mtishows.com. His books on musicals are available at Amazon.com.